The gourmet burger chain is set to open two Orlando locations. One at the shoppes at Millenia is now open. This is right next to the Mall at Millenia. 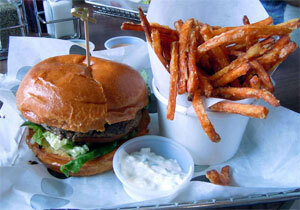 The second location near University of Central Florida opens sometime in February according to sources at Burger 21. Are you one of those people who salivate at the sight of a burger? We all love burgers and always look forward to experience the sumptuous taste of different burger types. Whether you are looking for a vegetable, chicken or meat burger, the best place to stop by is Burger 21. The sweet smell of burgers greets all customers who know what it means to grab their favorite burger at Burger 21. At Burger 21, not only are the burgers well done but they are prepared in a special and skillful way to bring out an excellent taste way beyond the expectations of the customer. Burger 21 has cut out itself as a leading burger house where customers get to experience the real taste of burgers.